Chinese artist Yang Yongliang is known for his detailed multimedia works which reinvent the Chinese landscape tradition. He tells Rebecca Fox about his passion for the environment. From a distance, it might seem that there are trees dotting the cliffs of Yang Yonglaing's landscape paintings. Then you step closer and realise the ''trees'' are in fact cranes. 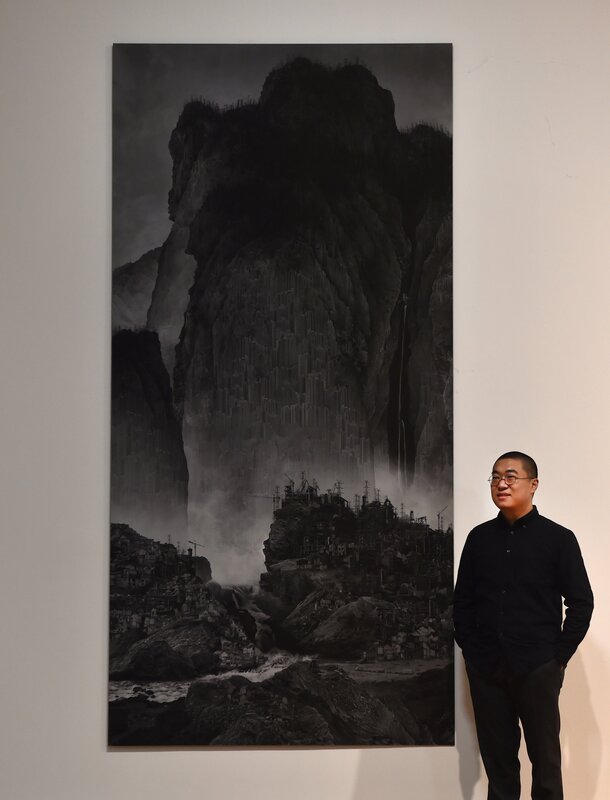 The large-scale detailed images Yang creates aim to draw attention to what he sees are major issues for society: environmental pollution and urbanisation. ''Instead of delivering or passing a message to the audience, I just raise the questions and leave the space for the audience to think about it themselves. I don't think the artist's role is to act as a promoting mechanism,'' Yang said through an interpreter. He does this by superimposing photographic images on to the craggy mountains and landscapes favoured by a movement of early Chinese artists known as the literati painters. The Artificial Wonderland series, which he started in 2010, features heavy mountain rocks with intricate details referring to Song Dynasty landscape painting. ''immersed in a Chinese culture environment''. He was trained in traditional Chinese painting and calligraphy and studied at the China Academy of Art in Shanghai. Yang (38) found that his artistic voice, bringing old and new together, developed very naturally. ''I always thinking about combining these two. Yang regards art as a reflection of the artist. To create his large works of art, Yang spends numerous hours photographing the environment around him or the views of urbanisation he requires to build up a database of images he then uses in his work. Just how much time it takes to create one of his works is hard to say. He creates on a large scale for a simple reason. He then uses digital technology to meld the two art forms. That continued when he came to New Zealand with Dunedin Public Art Gallery's International Visiting Artists Programme earlier this year, only this time he was concentrating on water. Staying near the ocean meant he had plenty of opportunities to take photographs of the water. Those pictures form the start of a new video project, View of the Water, where he reinterprets a very famous series of pictures from the Song Dynasty. He uses footage of the ocean, rivers and lakes shot during his time in New Zealand in these videos. Yang's work has been exhibited internationally. This year alone his work has been displayed in group shows in Singapore, Belgium, Taiwan, the United States, Japan, London, China and Germany and he has had solo shows at the Utah Museum of Fine Arts, in Salt Lake City, Sullivan+Strumpf in Sydney and Whitestone Gallery in Taipei. His work has been collected by more than 20 public institutions, including the British Museum, Brooklyn Museum, the Metropolitan Museum of Art in New York, Museum of Fine Arts Boston and San Francisco Asian Art Museum. In 2015, Artificial Wonderland II was shortlisted in the Prix Pictet - the global award in photography and sustainability. Yang has enjoyed his time in New Zealand. ''I found New Zealand hugely different from my home country. The environment is well protected ... I am personally very fond of this country. Also: Artist’s talk & tour, Yang Yongliang and curators Lucy Hammonds and Lauren Gutsell with translator Li Tang on Saturday. Then join Hammonds and Gutsell on a walk through the ‘‘New Networks: Contemporary Chinese Art’’ exhibition.